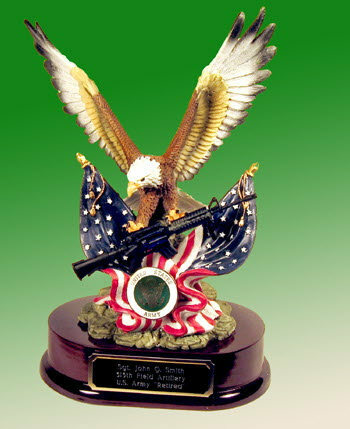 Flying Eagle holding an M 4 Rifle with Army pin [DSK-327] - $129.50 : Metalcraft by Blair - military gifts and memoribilia. This rendition has the U.S.Army pin. This is one of the most beautiful displays we have.. the Flying eagle is holding an M1 Garand rifle in it's claws.This display is shown in several military corp presentations, U.S.A. -- U.S.M.C. -- it could be the U.S.A.F. or even the Navy, Special OPS or what ever. The Eagle is made of a cast material and the rifle is plastic and it is an exact replica of the M1 Garand rifle.We can add just about any model miniature gun you desire.Obviously some fit better than others. I can not think of a better way to say thanks to someone in the military or to say congratualtions on your promotion, or any other salutation. This is a gift anyone would be proud to recieve ---- just as you would to give it..